Hexagon Ensemble - Five winds and piano. What characterizes the ensemble is its surprising repertoire, the great joy we have in playing together and the multidisciplinary nature of many of our programs. These are not our own words, but those of the press and our audiences. It is something that we are very proud of. Clearly, through our passion for quality, innovation and adventure, we manage to succeed in touching the hearts of those that listen to us. 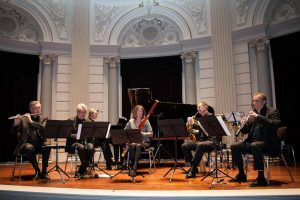 The ensemble recorded nine well-received cd’s, with a cross-section of beautiful chamber music written for wind instruments and the piano. The ensemble has also made concert tours to the United States, Russia (including the Republic of Bashkortostan), Germany, France, Italy, Belgium, Slovenia and the United Kingdom. In this new program, the Hexagon Ensemble pay homage to two near-forgotten composers Ernst Pauer and Ludwig Thuille and combine their works with that of the well-known master composer Johannes Brahms. Pauer and Thuille were hugely popular within their own times. And, once looking at their dusted-off manuscripts, we realize that their music deserves to be heard today as well. The members of the Hexagon Ensemble have a strong affinity with the Russian repertoire. This resulted in the acclaimed CD “The Russian Connection”. More recently – in 2014, 2015 and 2017 – the Hexagon Ensemble toured in the Russian Federation, including the Republic of Bashkortostan. This program consists of works by Ippolitov-Ivanov, Rimsky-Korsakov, Rachmaninoff and Mussorgsky. The members of the Hexagon Ensemble always look for cooperation with others. In this program, the Hexagon Ensemble is expanded with five string players in a surprising classical/romantic program, in which well known repertoire is combined with a selection of lesser known works that clearly should be better known. Balakirev, Rheinberger, Bruch and Mozart.